Day 3 of Toronto Fashion Week upped the cool factor with S.P. 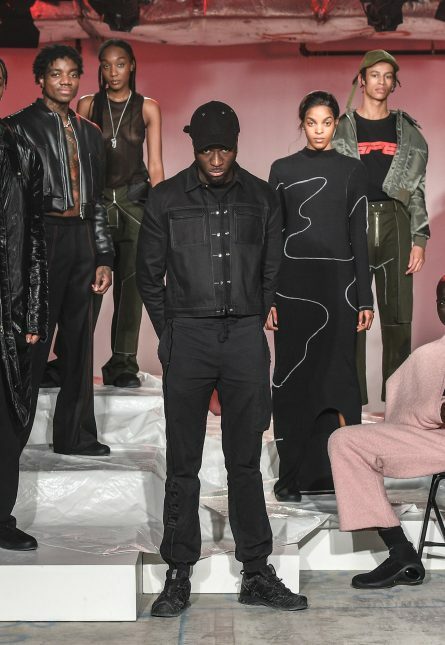 Badu’s Fall/Winter 2018 collection. Toronto-based designer Spencer Badu launched his millennial streetwear line in 2015 with a goal to break gender boundaries and challenge traditional fashion constructs. The brand went viral when A$AP Rocky wore a pair of S.P. Badu trackpants last summer and it’s been full speed ahead ever since. We sat down with Badu after the show to talk brand evolution, the colour pink and feminine power. How would you describe S.P. Badu and who you design for? Why is the collection called “Mother”?